While Sparkling Pointe wasn't #1 it was definitely a good stop. The bubbly was delightful, and the tasting room was clean and crisp with bright Brazilian inspired paintings. The tasting was $17 for four sparkling wines and bottles were $37-$42, however if you were to purchase 2 bottles the tasting was complimentary. Good, but still a bit pricey when we had lots to see on the island. They also host Carnival each spring and sell perfume made with two of their wines the Topaz and Seduction, the first is a light fresh scent and the later is a warmer fragrance. Surprisingly the clientele while we visited were all much older then the tasters we saw else where, and I'm not talking baby boomers, I'm thinking more like their parents that came on a bus. 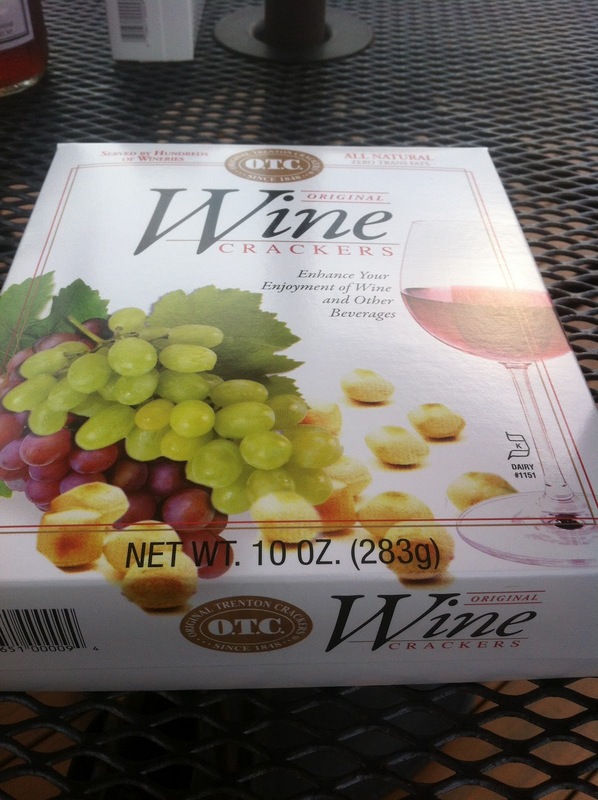 Not that they shouldn't enjoy their wine too, but it made for a very mellow stop. 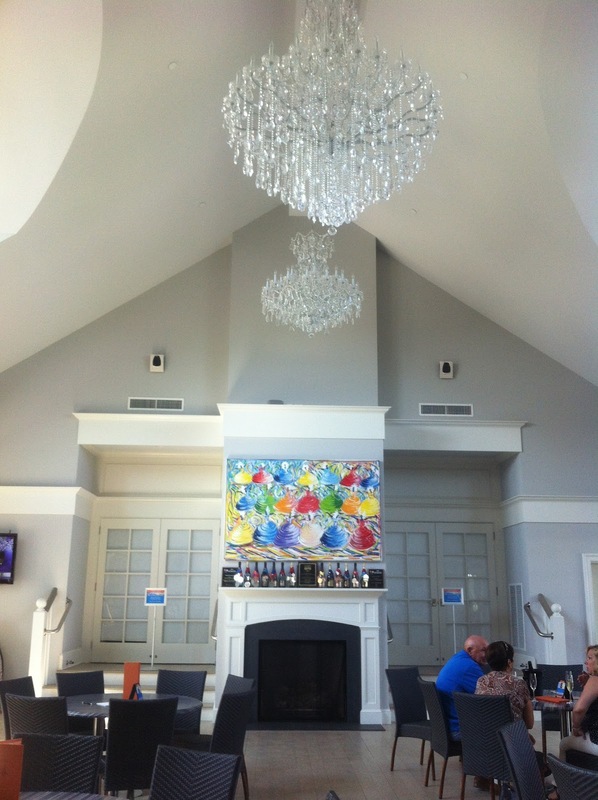 Perhaps visiting on one of their "Bossa Nova Fridays" would be a more ideal time for younger generations to visit. 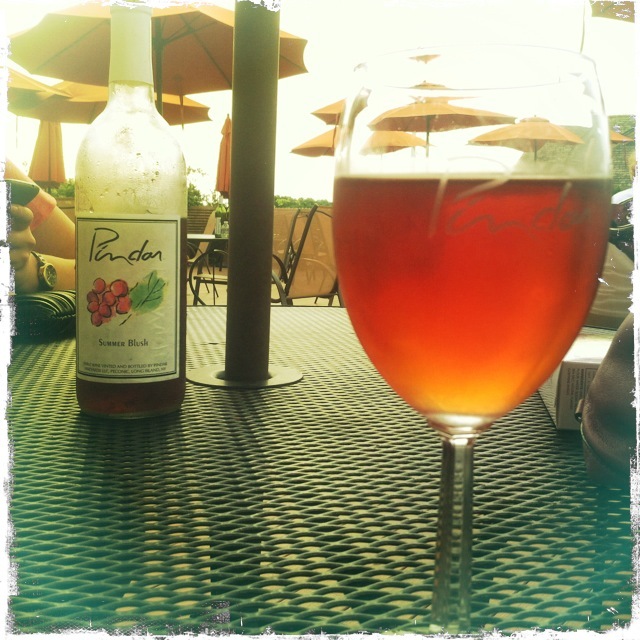 Pindar Vineyards has some enjoyable sweet wines that are good for sipping on their porch, this stop was just so overwhelming. There are two long tasting bars with servers quickly running back and forth between customers, our service was fine, we just really didn't have an opportunity to engage our server in conversation about the vineyard. They clearly do industrial sized production and sell about every wine accessory available. 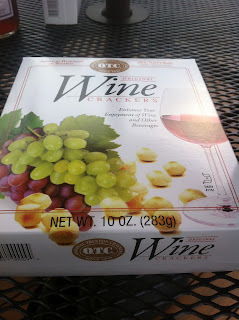 My favorite part about this vineyard was finding the wine crackers that I so love! Croteaux, where the theme is "Rose on Purpose," had great French themed ambiance and an enjoyable out door space, unfortunately the wines we tried just didn't thrill us. I believe we tried 3 wines for $10 and the second flight included all 6 wines for $15. Lastly, we tried a 2011 Cianco di Pinot Noir at Castillo di Borghese that was bright yet dry and seriously worth a taste, however the bottle will run you about $45. Of the Long Island Wineries that we visited there were some very clear favorites in no particular order they were Corey Creek (Bedell Cellars), DuckWalk Vineyards, Lieb Family Cellars, and Roanoke Vineyards. Corey Creek not only served a great variety of wines from Bedell Cellars, the staff was great and the views off the back porch were fantastic. There were whites, reds and roses that we all found enjoyable. The 2009 First Crush White a blend of Chardonnay and Sauvignon Blanc in steel was a heavy favorite and while selling 2 for $25 it was a wine we couldn't leave without! The 2011 Taste Rose (Merlot, Cab Franc & Syrah) had hints of strawberry and was almost effervescent, or so it tasted. The 2009 First Crush Red was a plend of 82% Merlot and 18% Cab Franc that had a nose like Chambourcin, but reminded me more of a Sangiovese, very smooth and completely fermented in stainless steel; of all the reds we tried this was by far the best outside of Roanoke. Finally the 2011 Viognier was very complex with hints of both pineapple and peaches but completely dry. We each decided on different wines to sit and enjoy on the porch and as we did they happened to have local oysters for the day which may have been the highlight of Zoe's day. Lieb Family Cellars also had an inviting staff and did a great job organizing their flights by whites, summer reds and rose. 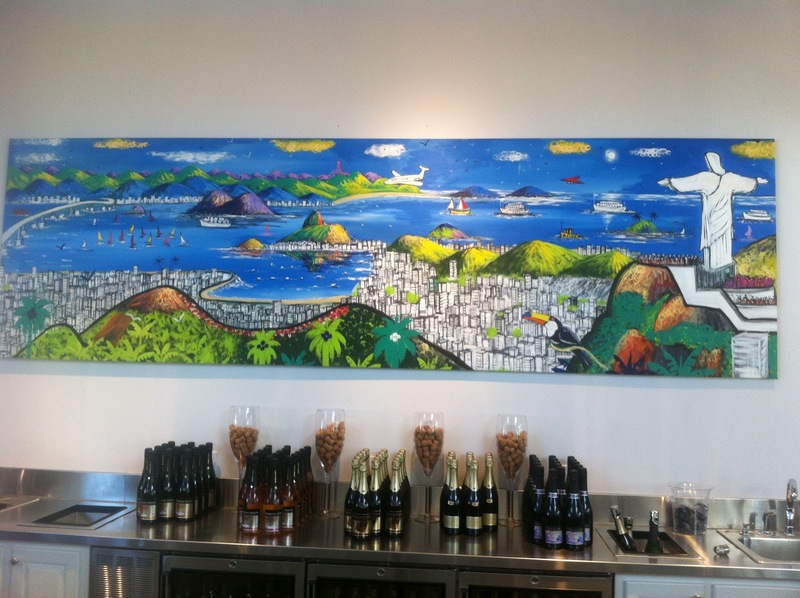 Their tasting room was light, airy and decorated with local art. While I went for the white flight Marlene & Zoe opted for the rose. Our favorites were the 2010 Bridge Lane Merlot Blanc which was crisp and refreshing, plus for $17 a bottle you can't go wrong. We also enjoyed the 2007 Reserve Chardonnay blended in steel and oak so it came out slightly sweet, but with a buttery finish. The 2008 Petit Verdot was also slightly buttery and very smooth. Finally the 2010 Pinot Blanc Alsace was a big winner, with 8.5% rs it surprised me by not being syrupy at all, Lieb is also the only winery in North Fork to grow Pinot Blanc. As this was my first trip to Lieb I thought it was great, Zoe however was pleasantly surprised by improvements in the wine from previous visits. It just goes to show that every new release really is worth a try. 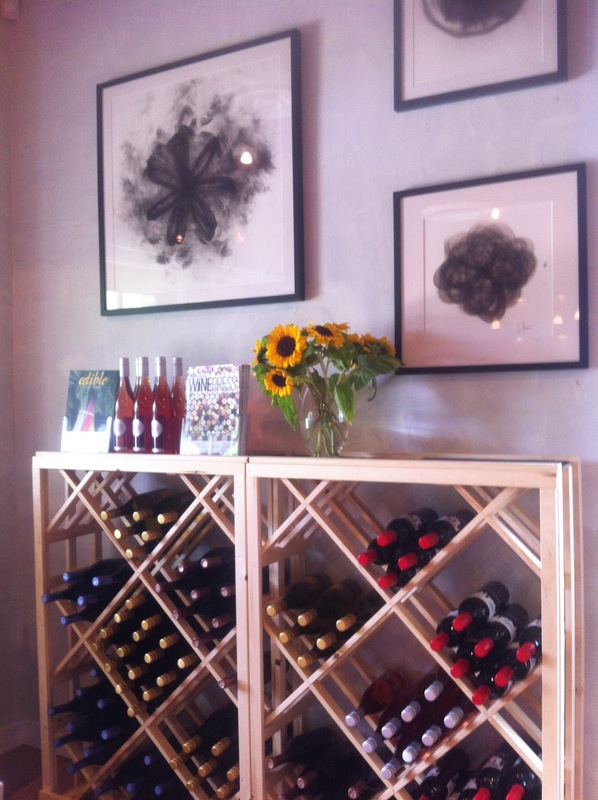 Also at the top of the list was DuckWalk Vineyards North, this is one of Zoe and Marlene's tried and true favorites because of the wine and because of their favorite staff member, Connor. Marlene is a big fan of dessert wines so before we even go there I think she had mentally purchased a case of their 2010 Aphrodite, a late harvest Gewurztraminer. DuckWalk had 21 wines ready to pour and for $8 you got to pick which 5 to try. I always find this a challenge because you could end up with the best or the worst of what they have. Luckily I was with some experienced tasters there so I tried a red or two then went to the blends and dessert wines. Dessert wines are clearly their specialty and they do them well. As mentioned the 2010 Aphrodite was a big hit as was their 2010 Blueberry Port which was a bit more tart than sweet. The Boysenberry Dessert Wine was great and could be used on desserts (or pancakes) or sipped on its own and the 2008 Vidal Blanc Ice wine was a quality ice wine. The trunk of my car was noticeably heavier after this stop. 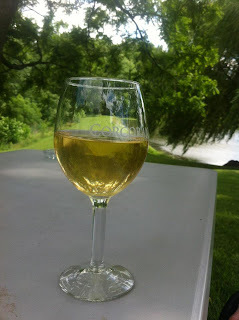 Since its summer I was happy with the whites and roses that we found on the North Fork, but reds are my favorite and I was sorely disappointed with several that we found on the trail, this changed after our visit to Roanoke Vineyards. Roanoke serves a few whites but their main focus is on reds and they served quality. They began planting in 2000 and opened in 2004, some of the other vineyards have had their vines in the ground for over 30 years yet their reds were not as good as what we found here. The 2008 Blend One and 2008 Blend 2 were comprised of different proportions of Cabernet Franc, Cab Sav and Merlot, but both were equally solid, smooth red wines. We also enjoyed the 2008 Cabernet Sav which was slightly more dry than a typical Cab Sav and the 2009 Marco Tulio a Cab Franc and Cab Sav blend that is peppy and per Zoe with fruit and birch hints. the tasting room is decorated in dark woods and leather, I imagine its a great hide-away in the winter. 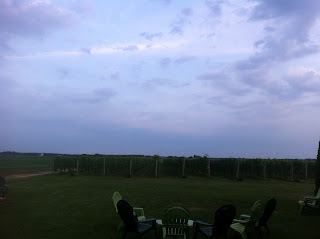 After our long day we each took a glass out to the back patio where several Adirondack chairs awaited and watched the sunset. 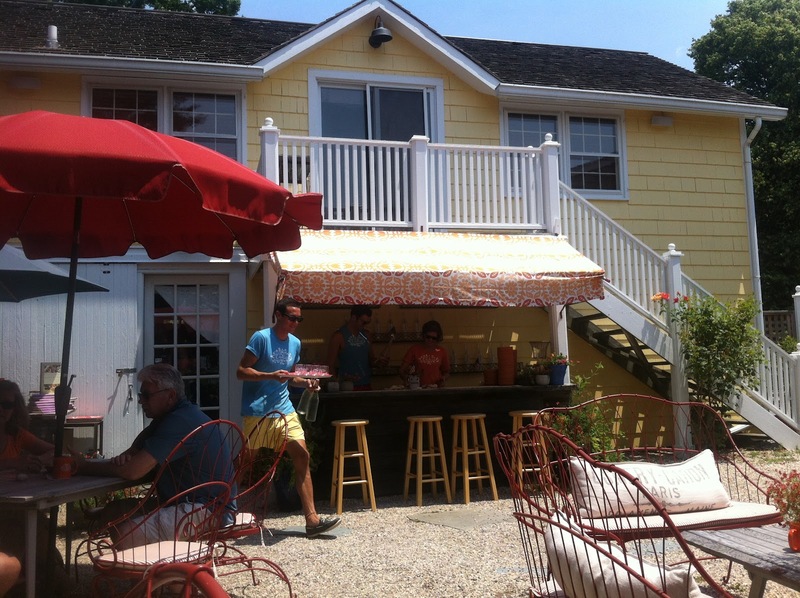 What could be a more perfect time to visit Long Island and the North Fork wine trail than in the summer? 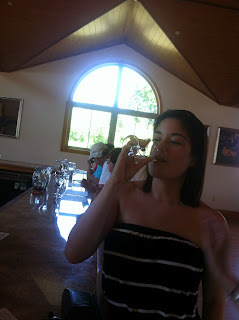 Considering they have the white, rose and dessert wines figured out it was a great time to visit! With a few days on Long Island we, my now New York City based college girls Marlene, Zoe & I, were able to visit 11 unique vineyards. Like Virginia winemakers, the staff members that we met all expressed great support for their neighboring vineyards that trickle all the way up the island coast line. Here is a quick synopsis of where we went and what we found, I'll break out the highlights with more deets. 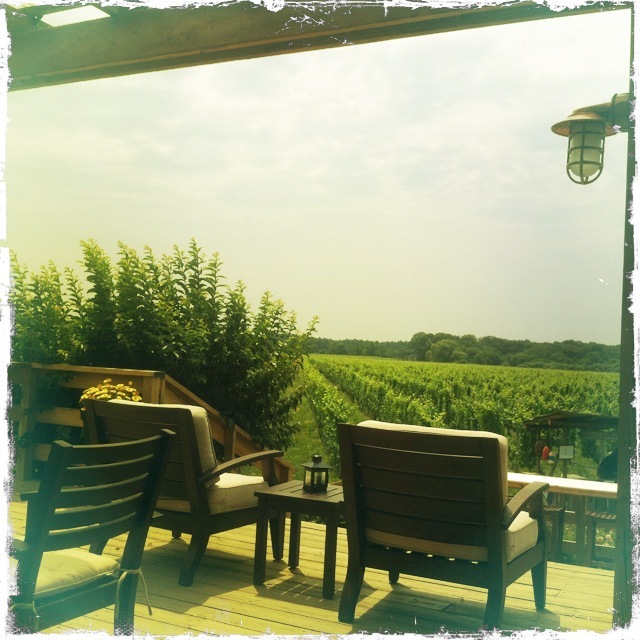 How did we pick where to go with limited time and nearly 50 vineyards to choose from most 1/2 mile from one to the next? Considering Zoe is a big fan of Rose, Marlene can not do without dessert wines and I enjoy a crisp white or rich red, we mixed it up and took some recommendations from friends on the street, made sure to stop at some of Zoe's tried and true favs and we got some input from Lenn Thompson of the New York Cork Report. We also ate some quality food with some very nice views. We had killer lobsta' rolls at the Old Mill Inn right on the water! A delish and adorable spot for dinner is Love Lane Kitchen, fresh local goods were served there. Early in June I ran the Virginia Wine Country Half Marathon and while post race we-Debbie & I-didn't visit too many wineries we did get our taste on at the post race event. 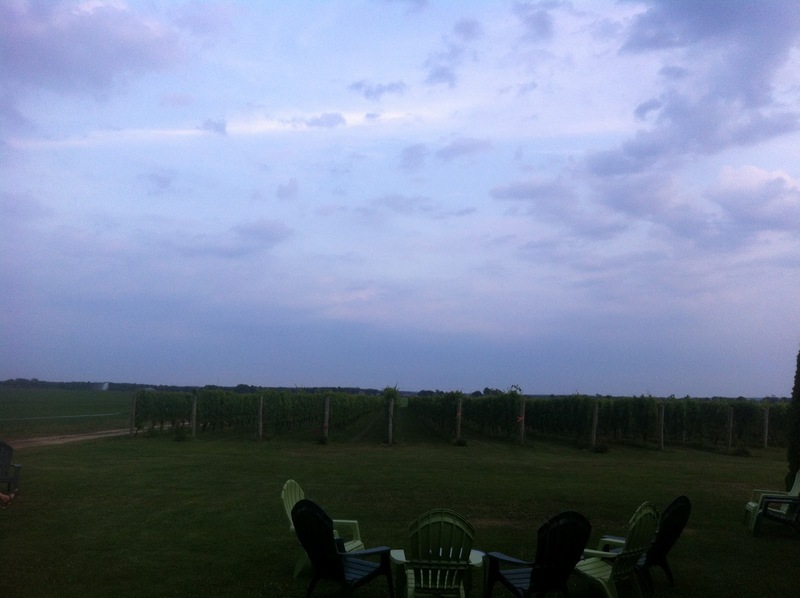 I know for sure we had some great wines from Notaviva Vineyards, Bluemont Vineyards, North Gate Vineyard, Zephaniah Farm Vineyard and the gracious host Doukenie Winery. We had others too, but those are the stand outs and for those that I haven't been to yet, I look forward to a tasting room visit. 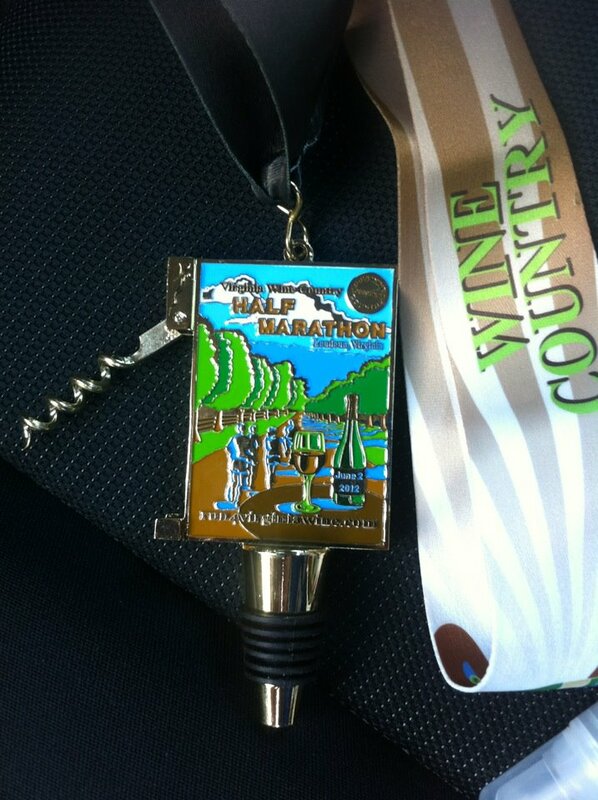 Most vineyards were serving 2 whites and 2 reds, but after 13.1 miles my usual red-friendly palate frowned at anything darker than a blush...but I was o.k. with that! Quite possibly my favorite medal! We managed to find a barbecue spot for lunch, Boodacades BBQ which hit the spot and gave us enough energy to make to one vineyard, Corcoran Vineyards-we were up at 4am to get out to the race by 6:00am from DC. Corcoran was a perfect quiet stop and unlike my typical tastings I didn't take note or ask for a tour, we just did the standard tasting then settled outside with a glass of refreshing white, which may or may not have been the Traminette. Regardless, it was delightful and as much as we wanted to visit the brewery it was nearing 2pm and with an hour and half to get home we called it a day! Sipping near the quiet pond. 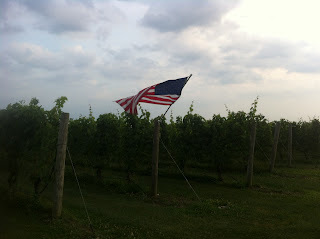 June was a bit of a blur so I don't remember exactly when we made a stop a Sugarloaf Mountain Vineyard, but I think it was near the middle of the month. I do remember that we made the stop en route to a G. Love & Special Sauce concert up in Fredrick, Maryland. I'm also fairly certain that it was a Sunday and Sugarloaf was hosting an event that involved bikers (the self propelled kind) and dogs so it was a busy day. The tasting bars were set up under tents outside so we, Lori and I stepped up to the bar, while Summer opted to cut the chase and go straight for a glass of Sangria. We tasted about 8 wines for $10, the majority grown on site with the exception of the Virginia Viognier. We favored the 2011 Viognier, 2011 Pinot Grigio and the 2009 EVOE!, a 70% Merlot blend aged 19 months in French oak and close to $40 per bottle. It also sounded like it was one of Maryland's older wineries. After the tasting we picked up some of the Pinot Grigio for about $20, but opted to sip on some Sangria that afternoon which was refreshing and served with fresh peaches and blueberries. There aren't many other wineries anywhere near Sugarloaf so it seemed to be a nice destination as we enjoyed live music in the shade or an intriguing stop while en route to Fredrick or the surrounding area.